The last time Harry Potter sets came out, around 10 years ago, I was in my Dark Ages, so when the new Wizarding World sets were announced back in May, I was ridiculously excited. 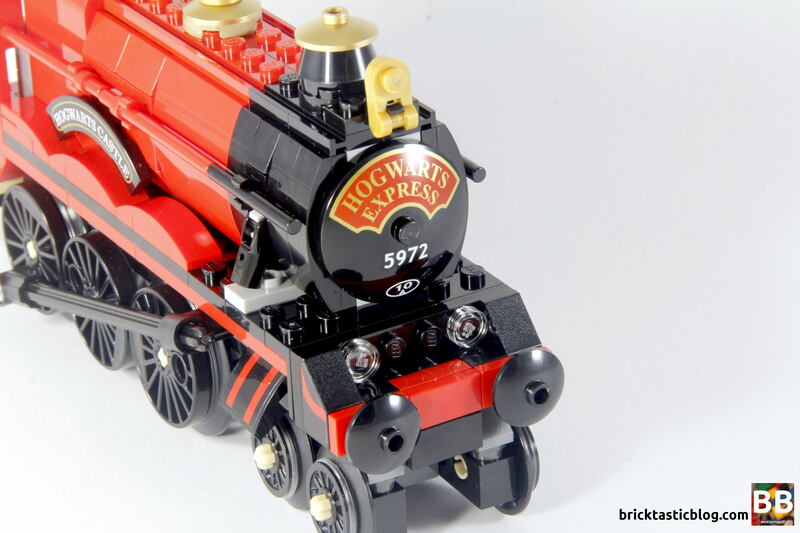 Of all of the new Harry Potter based sets, one of the most popular ones was 75955 Hogwarts Express. 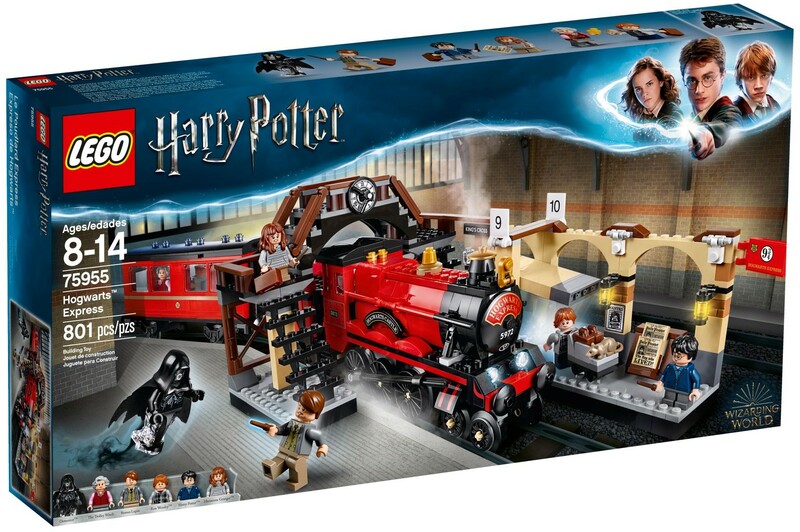 Train and Harry Potter fans alike flocked to the interwebs to purchase a copy, and the set was on back order from LEGO Shop Online in no time at all. There’s been a number of different versions of the famous Hogwarts Express over the years, with the first iteration coming in 2001, as 4708 Hogwarts Express. Some have looked excellent, and others have not. Where will 75955 fit in? Read on to find out. Inside the box, you can expect to find seven numbered bags, one instruction booklet, and a sticker sheet with 18 stickers. 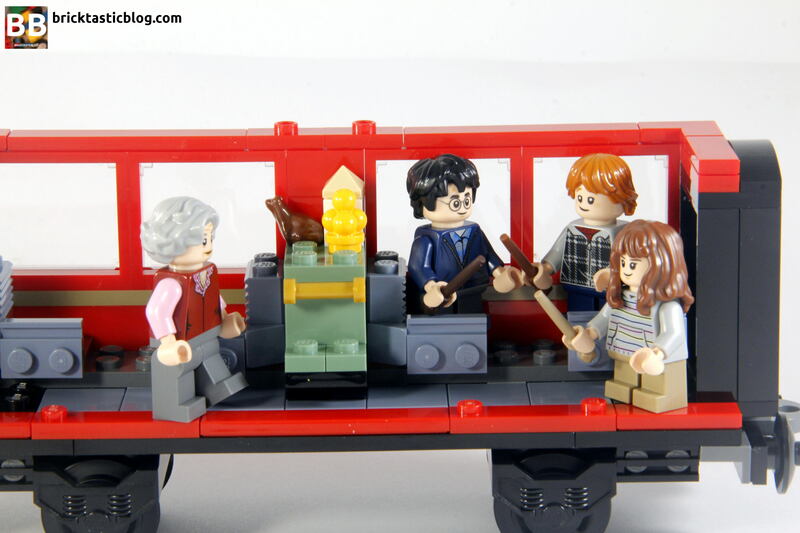 There’s three minifigures included in the set – Harry, Ron and Hermione, as well as Remus Lupin, the Trolley Witch, and a Dementor. 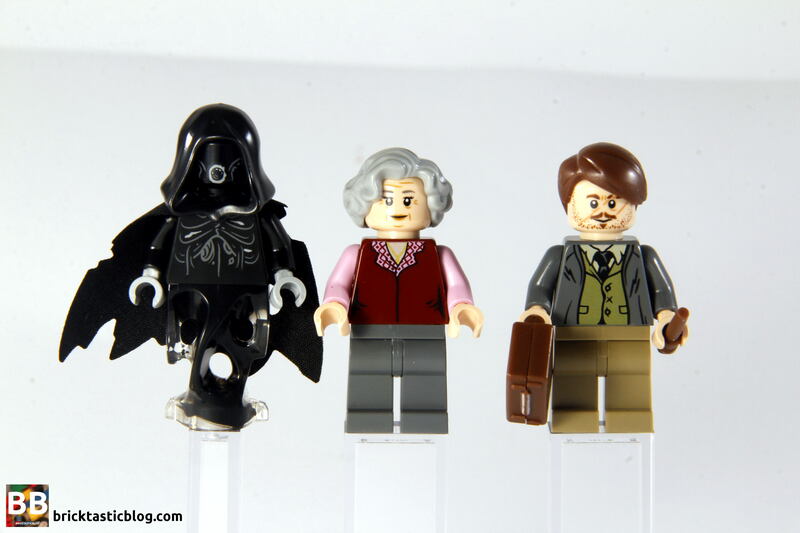 The three students all have small legs, and all the minifigures except for the Dementor have dual printed heads. The students all have excited and scared faces – perfect for firstly getting to Platform 9 3/4, and then scared after seeing the Dementor. There’s a number of unique elements here too – in the Dementor, and the torsos of Lupin, Hermione, and the Trolley Witch. Lupin’s head is also unique to the set. 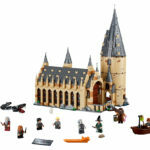 The other minifigures have been seen in various combinations in other sets, including those in the rest of the Wizarding World theme. 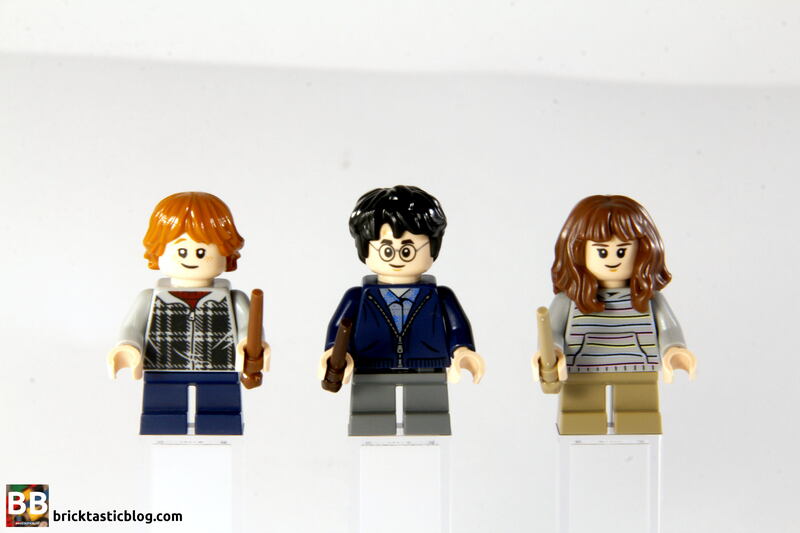 It’s a shame the students’ legs are fixed smaller legs, and not the new versions seen in the new Wizarding World Collectible Minifigure Series. That would have been very exciting! It’s most likely because this is from one of the earlier movies, Prisoner of Azkaban, but even so, they aren’t as little as when we first met them. I understand that it’s a good idea to keep the new element inclusions for the highly sought after CMFs, but it still looks a little odd, given the age of the students in the source material. Harry has a dark blue zipped hoodie and blue patterned shirt, with pants. His hair is black and messy, and looks fantastic. He’s also got a new wand, and a suitcase that sits on the trolley. Ron has a grey checked jacket and dark red top underneath, with blue pants. His hair is spot on for the younger version of the character, although the eyes look very strange! The whites of the eyes are a bit too big, and make him look odd. It’s especially noticeable when he’s looking scared, as the black is smaller, making the whites more pronounced. In addition to a wand and suitcase, Ron also has Scabbers, in a new rat mould. I love the new look rat – there’s a lot more detail and shaping. It’s also good to see Scabbers getting an upgrade, as there was a lot more to him as was proven in the story! Hermione has a striped hoodie and light brown pants, which look great, but the stand out feature for Hermione is the brand new hair element. It’s perfect! The hair falls beautifully over her shoulders, and it looks very natural. I’m looking forward to seeing other sets using it. Hermione’s also got a wand, in a tan colour. On to the adults! Professor Remus Lupin is up first. Lupin, a werewolf, looks great in minifigure form, with his messy torso and swept aside hair. It’s a pity the legs aren’t printed with the jacket as well, but it’s ok, because his head is brilliant! With Lupin in teacher form or angry werewolf form, he looks spot on. If only we could get a Nymphadora Tonks minifigure to go with him! He does have a wand, which will be useful against the Dementor. The Trolley Witch is an understated part of the story, but is seen when the students are travelling on the Hogwarts Express. The kindly old lady pushes around the Honeydukes Express, the trolley version of Honeydukes, the shop that supplies the goodies. The minifigure version looks excellent, in a dark red vest, pink top and gold necklace, just like the movie version. She comes with a LEGO version of the Honeydukes Express. Lastly there’s the Dementor. The pure evil wraith creature looks excellent. The use of the ghost lower part is very clever and suits it perfectly. These were first seen in the Ninjago Possession subtheme, and then recoloured for use in Series 14 of the Collectible Minifigure Series. The cloack is worn and damaged and looks excellent, and the hood that covers the terrifying face is great. The hands are too light for me, but the face is spot on, as well as the torso print. I love it. Other noteable parts inclusions are the two printed parts – the dish at the front of the boiler, and the nameplates. These look fantastic. There’s the printed Daily Prophet 2×2 tiles, the train wheels, and I like the 4×6 plates with 12 studs. While that last one is not all that exciting in comparison, it’s nice that we get 10 of them! There’s also the wands. This was the first time I have seen them, and they look superb! I absolutely love them, and there’s seven different colours. It’s such an improvement from the 4L bars that were used in previous versions! The sizes are much more appropriate to the minifigures. Thanks to a couple of articles on New Elementary from Elspeth De Montes, there’s now some alternate usage possibilities for not only the wand, but the sprue as well. In terms of elements unique to this set, there’s really only the minifigures. The rest appear in at least one other set, and aren’t as exciting. Sure, the minifigures are good, but there are other sets in this line-up that have far more interesting new inclusions. Train sets are innately playable. They’re the types of sets that are a lot of fun to play with, and draw a crowd of any age. It doesn’t matter if you had a train set as a kid, or like me, missed out and had them when you were older. They’re the type of toy, and type of LEGO set that is always fun to play with. 75955 Hogwarts Express is the same, but there’s a crucial difference that I’ll get to in another section. 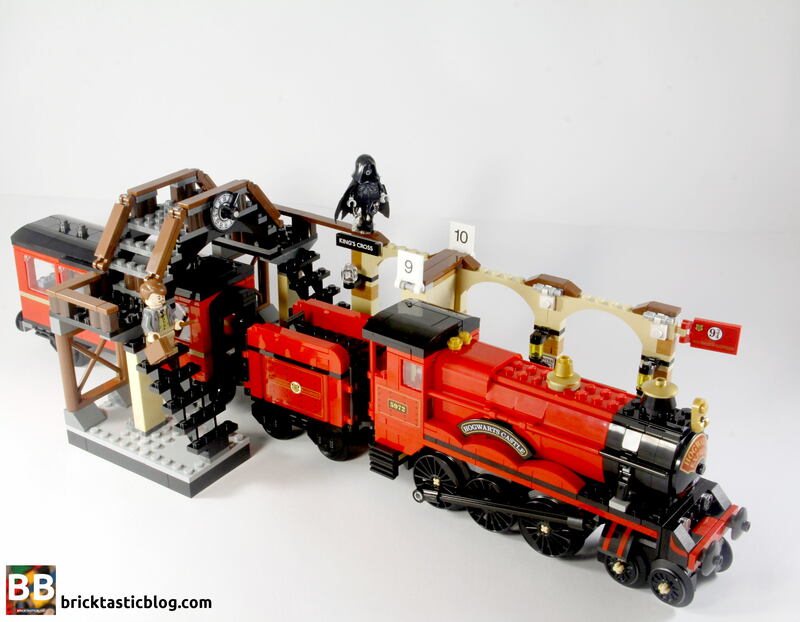 There’s the obvious train to play with, but there’s also the removable roof and wall of the carriage, and the cleverly executed entrance to Platform 9 3/4. It’s a lot of fun to recreate the scenes from the book and the movie with the set, and the set as a whole works really well. One play aspect that completely surprised me was the clock. 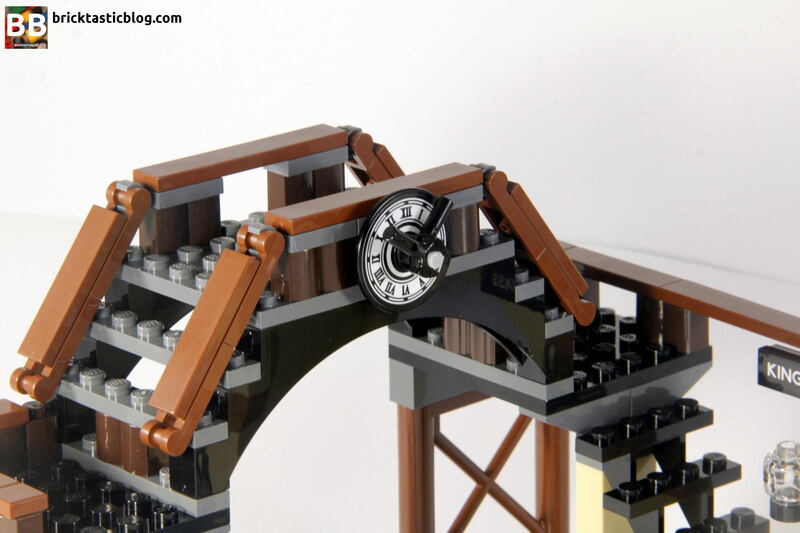 It’s made up of separate parts so the clock is actually able to be used to set a particular time. This is a detail I’ll definitely be using in MOCs in the future. There’s also the minor detail of the truck lock. At the front of the locomotive, there’s a 2×2 panel between the buffers that can be pushed down to lock the truck when rolling around on carpet, and then pushed up so the truck can move freely on a track. It’s very cleverly designed, and is a good feature. The build process starts off with the luggage trolley. It’s simple and works well. 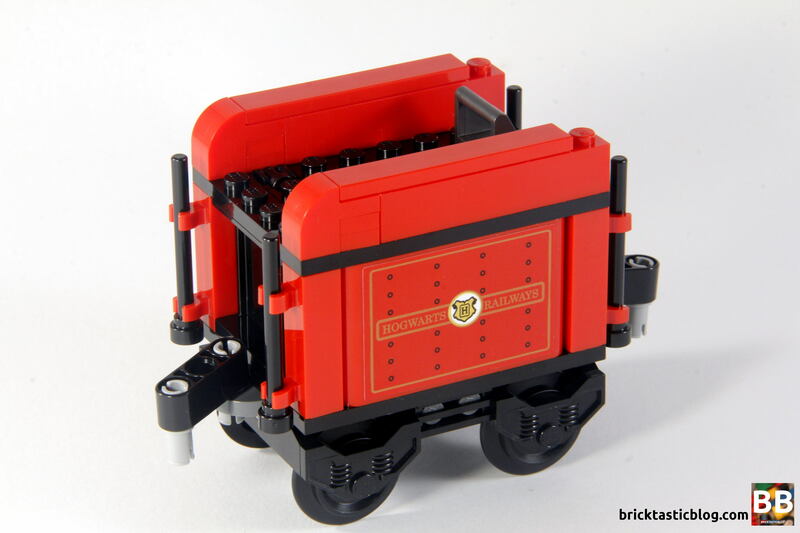 It’s a shame the trolleys don’t include actual wheels, instead the designers have opted for black axle plates. It works to an extent, but actual wheels would have been a much better option. The first two bags are used in the Kings Cross Station build. There’s the main platform, a pedestrian footbridge, and a very small section of platform on the other side, used simply to support the footbridge. The platform proper is very simple to build. As I was putting it together, I thought it was equal in simplicity to a Juniors build. Straight forward bricks on bricks, with large parts. The newspaper stand for the Daily Prophet is also very simple, and looks very effective. The footbridge is another easy build, with a few more little complexities (if you can call it that) in the handrails. Bags three and four are full of parts for the locomotive. 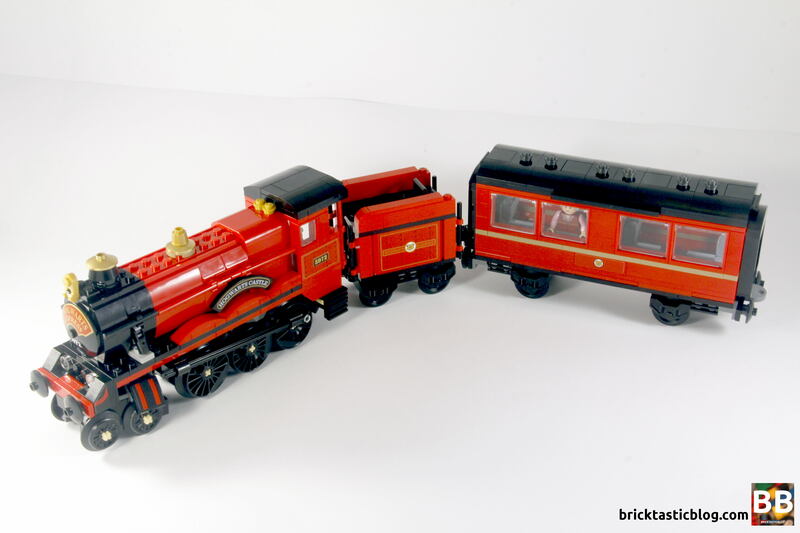 For a train that doesn’t have the single mould couplings, this set does really well to mimic the look. It’s a lot of fun to build! There’s a bit of SNOT thrown in for good measure, and some excellent details in the driver’s compartment that were a nice surprise when building. The boiler section of the locomotive is comprised of SNOT work, and is built separately, before adding it on to the locomotive chassis. 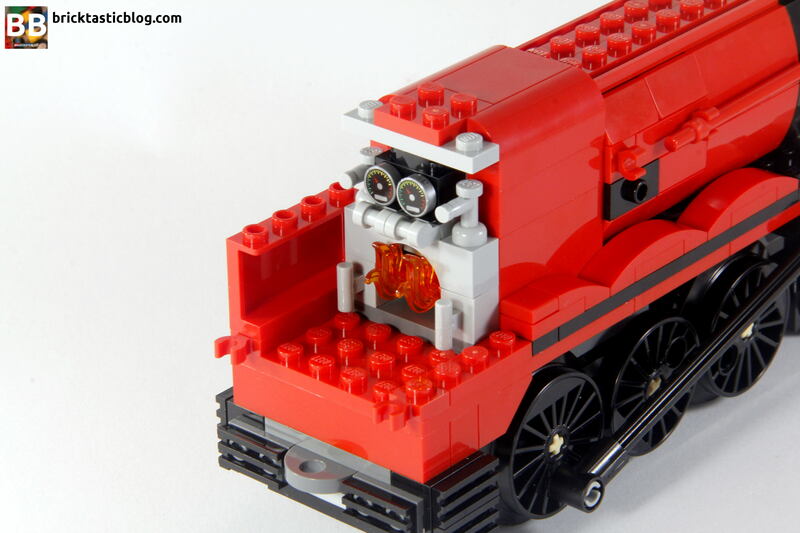 I like the use of the pearl gold elements for the whistles and bells on the train, and the wheels are also excellent. It’s a shame the central large wheel isn’t connected to the other two, but it still looks great. Bag five makes up the coal tender. It’s a very simple and is thrown together in no time at all. The use of a Technic beam and pins is seen in the coupling, which is also used to connect the carriage to the tender. The tender is also hollow, so there’s some room inside to store a few things, or hide the Dementor! The final two bags are for the carriage. It’s another easy build, but is quite enjoyable. 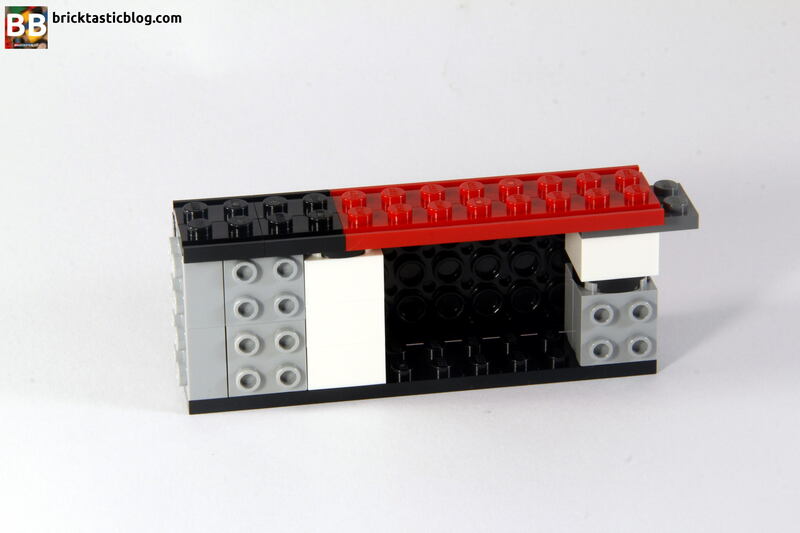 The removable wall and roof are built separately and added in to complete the set. In this step, the Honeydukes Express lolly trolley is also built. It’s a quick one again, and also has a distinct lack of wheels. Overall buildwise, it’s not arduous, and probably won’t test your skill. It’s at the easier end of the skill scale, and will be ideal for younger fans of the Harry Potter franchise. It’s strong, and the whole station, can be picked up without it breaking apart. I found that it will loosen if picked up by the footbridge, but only if you’re a little rougher. The actual Hogwarts Express is very strong. At first glance, this set looks great, and has instant appeal, but there are a few things that the designers have overlooked. The colour scheme of red and black is spot on, and the detailing on the station, although very paired down, looks great too. The look of the footbridge, with the wooden railings is superb, and while the clock is a little strange from the side, from the front, it’s brilliant. It’s a pity the platform doesn’t continue on the other side of the footbridge, but it would block the train if it’s on a display. 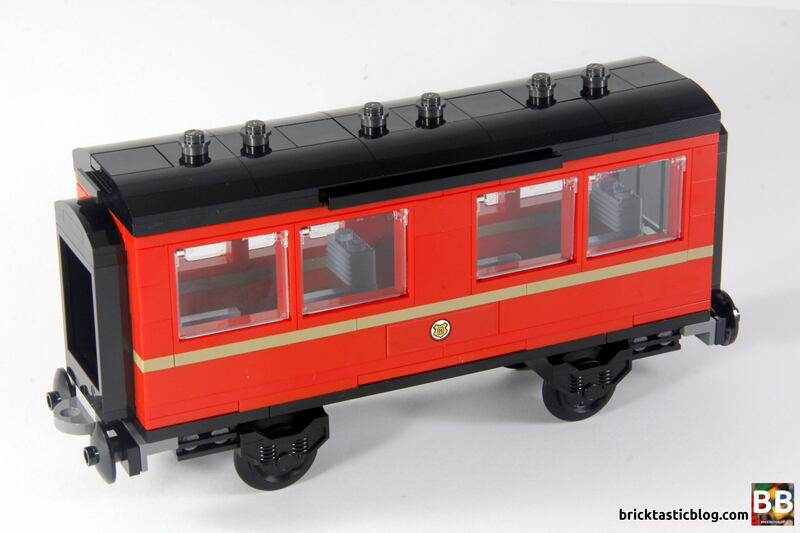 Speaking of the train, while it looks great in red and black, there’s a few things amiss. To me, the boiler looks a little too squat and short. From what I can tell, the proportions are a little off. I don’t know exactly what it is. Maybe the wheels, maybe the cab, but something is off. It’s too short. It’s a little bit of a shame that the light grey of the SNOT bricks can be seen behind the dish at the front of the boiler, too. It’s such a minor thing, but it would have been an easy fix. There’s also a couple of issues with the tender. It’s too short, maybe by half, and only has four wheels, with the actual train’s tender has six. It exists by the way – it’s real name is the Jacobite, and it runs through Western Scotland. From an aesthetics point of view, I would have preferred to see some ‘coal’ in the form of some dark grey or black cheese slopes and studs on the top of the compartment lid. The carriage is probably closer to the mark, but it’s also a little too skinny to have the trolley sitting in the aisle with the wall and roof on. It’s not the worst thing in the world though – it can fit nicely in between the chairs, and allows you to make some nice displays. The sand blue chairs against the red and black look great. There’s a lot of detail that’s missed, but that’s what you get when there’s size restrictions. It’s a little strange having the front and back of the carriage left open, but it does open up the possibilities for adding more carriages. It’s still a stunning set, and looks great on a shelf, and many Harry Potter fans will not care in the slightest, but there are a few shortcomings. For a train set, it’s still a cracker. In Australia, 75955 Hogwarts Express isn’t cheap. At $140, you’ll probably notice it on your bank statement. 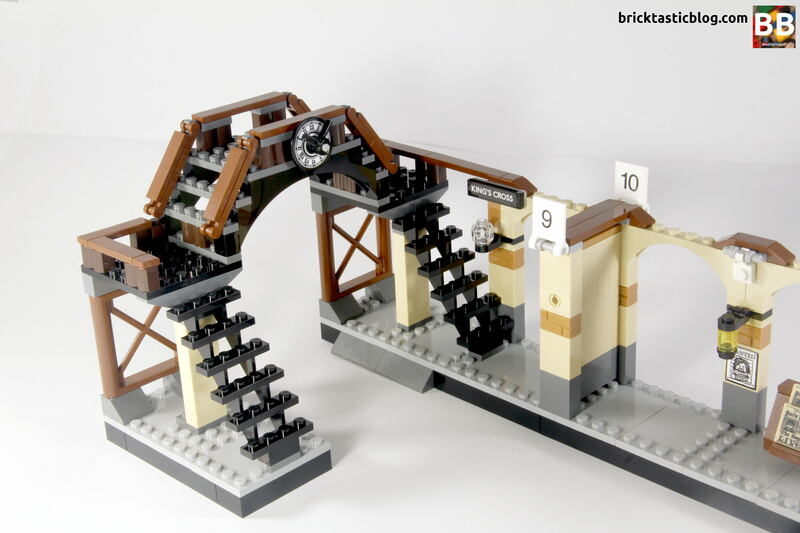 There are some good parts, and the obvious factor that it’s another train set, but there’s not many unique parts that aren’t minifigures. Even two of these – Harry and Ron – are found in this clothing combination in another set – 75950 Aragog’s Lair. It also doesn’t come with any track or power functions, which would make this set incredibly more valuable. It’s a great set, but I don’t think it’s worth $140. I’d blame that on the licensing factor. 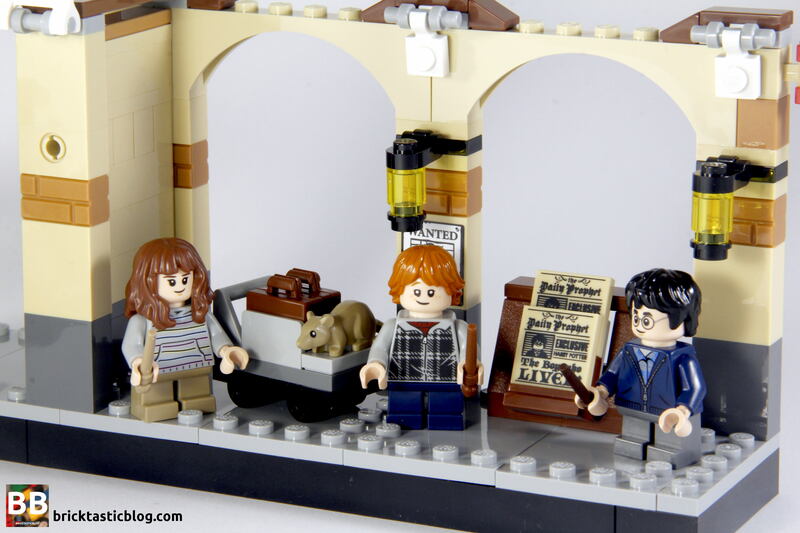 Harry Potter is back in the LEGO world, and that’s a very good thing. I can’t understate that enough! For those like me that missed out on the initial sets, it’s fantastic that it’s back, and looking the way it does. 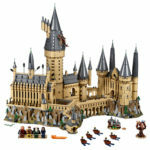 There’s not too many sets to collect in the first wave, and it’s moderately achievable for most, if you don’t include the new and beautiful (and crazy expensive) 71043 Hogwarts Castle. 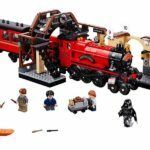 If you’re a Harry Potter fan, 75955 Hogwarts Express is a must have set – that was evident by the sales figures of this set on the first day! If you can only have one set from the new theme, this is the one to get.